CAPF comes under parliamentary services that assist Defense Services across national borders. There are a number of forces that come under this category namely – The Indo – Tibetan Border Police ITBP, The Central Reserve Police Force CRPF, The Central Industrial Security ForceCISF, The Border Security Force BSF, The Sashastra Seema Bal SSBand The State Police Forces & Home guards. After selection and training; the candidates are appointed as Assistant Commandant and after the successful service of 20 years candidates are promoted to the rank of DIG or IG as per their cadre. UPSC holds special CAPF (AC) examination; candidates must clear the written exam to reach the second level of selection process, i.e. Interview. Age Limit: 20 to 25 Years on Aug 01 in the year of examination held. Interview Marks: as per UPSC standards. General Mental Ability: This section includes questions pertaining to data interpretation, quantitative aptitude, arithmetical ability and logical reasoning. General Science: This section is to check the awareness of candidates regarding the scientific phenomena that take place in day to day life. Questions are mainly related to environmental science, IT & biotech. Current Events: Candidate’s knowledge across national and global importance is checked across multiple verticals like business, industrialization, societal issues, music, literature, culture, sports, governance, etc. National Politics & Economy: This section covers everything about Indian Political System, The Constitution of India, Regional Issues, Public Administration, Economic Development, International Security Issues, Civics and Human Rights. Indian History: Questions related to freedom movement of India, social reforms, economic reforms, growth reforms & political reforms would be asked in this section. Geography:This section tests candidate’s knowledge about the geographic aspects of India and world. PART A: Essay Questions constitute Part A of Paper(II) which is of 80 Marks. Candidates are supposed to write descriptive answers in either Hindi or English medium as per their choice. Topics covered in this section include Polity & Economy, Freedom Movements & Struggle, Modern Indian History, Geography, Security Issues, Human Rights, etc. PART B: Under Part B of Part (II) Paper; candidate’s comprehension skills, precise writing skills, communication skills and English language skills are checked. Part B is of total 120 marks. 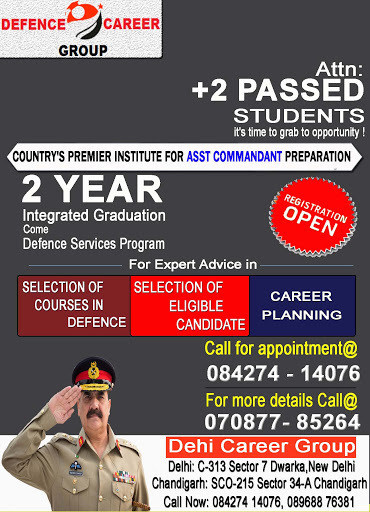 Why Defence Career Group as Guidance for Assistant Commandant Exam? Join CAPF Coaching today to join your choicest Centralized Forces as Assistant Commandant. Welcome to DEFENCE CAREER GROUP.